An advantage of teaching masonry is that it provides the opportunity to cover all aspects of structural engineering in one course. This is due to the simple nature of most masonry buildings. In one 14-week course, we are able to briefly cover loads and load combinations, materials, analysis (both out-of-plane and in-plane load distribution through the diaphragm), design of an entire one-story building, details and specifications. This helps students become familiar with and understand the entire design process, which benefits them in other courses. In the Structural Engineering Laboratory’s masonry component, students mix mortar and lay brick to build a 24" x 36" masonry wall. Using a vacuum (right), they then load the wall with air pressure to induce flexural failure near mid-height. Test results are computed, estimates applied and then compared to values for allowable tension stress in unreinforced masonry according to masonry code TMS 402. Like many structural engineering graduates, I did not have any courses in masonry at either the undergraduate or graduate level. My first introduction to masonry was in high school while working at a camp during the summer. I was helping with maintenance and was the mortar mixer and block carrier for several projects. We mixed all of the mortar by hand and I quickly learned the proper consistency of mortar. All of the projects were unreinforced masonry, but this experience has been valuable as I learned how a masonry wall was constructed. My professional introduction to masonry came as a university instructor via a research project. Many of the buildings at the Y-12 Department of Energy (DOE) National Security Complex facility in Oak Ridge TN were constructed during the 1940s as temporary buildings. Construction was non-rigid steel frame with unreinforced clay tile infill. In the early 1990s, DOE was concerned about the seismic resistance of these buildings. I became involved in the research project that involved both experimental testing and analytical modeling of the unreinforced masonry infill. Although clay tile was not typical masonry, my interest was piqued. I attended the 1992 University Professors’ Masonry Workshop (UPMW) presented by The Masonry Society (TMS) which inspired me to create a course in structural masonry design. The UPMW provided resources and information for structuring the course. I also relied on the expertise of local industry leaders for information on regional materials and practices. In 1993, I taught the first Masonry Design course offered at the University of Tennessee in many years. Which version of the building code to use is a decision to be made when teaching a design course. Based on data from the International Code Council as of May 2016. Eleven states had adopted the 2015 IBC and were thus using the 2013 TMS 402/602 Masonry Code and Specification. About half the states were using the 2012 IBC (2011 TMS 402/602) and another fifth were using the 2009 IBC (2008 TMS 402/602). Tennessee was on the 2006 IBC (2005 TMS 402/602). Nonetheless, I always use the most recent code in class. It is important that students know the most recent developments and are prepared for what is coming. I do point out changes in the code and also give background, so they can be comfortable designing with any code edition. My involvement in TMS has proved to be valuable in this regard. It keeps me up-to-date with current trends and issues and provides good contacts for additional information. When I began teaching masonry design, Allowable Stress Design (ASD) was the only method. In 2002, Strength Design (SD) was added to the code. SD was gradually incorporated until the course was about half ASD and half SD. Recently, I have spent most of the time teaching SD, with only about a week and a half on ASD. The reason is two-fold. Strength Design in masonry is very similar to what students learn in concrete design. This makes it easier for them to pick up. Second, Strength Design generally produces more efficient designs than Allowable Stress Design. For example, trial designs of masonry lintels showed that only 40-80% of reinforcement was required using SD as opposed to ASD. Strength Design also provides significant savings in reinforcement for shear walls. A recent trend in teaching pedagogy is the flipped classroom. In this approach, students watch videos prior to coming to class and class time is used for discussion, answering questions and problem solving. I have flipped the classroom for three lectures or class sessions. Each lecture’s lesson plan consisted of four to six short videos and a question or two related to each video. Students must answer the questions before class to get credit. There is also a short feedback form with two questions: What was the muddiest point of the topic? and What was the most interesting thing you learned? Results of the feedback are very interesting and the basis for class discussion. For one group, the muddiest point on the topic of reinforcement was splice length. The fact that students struggle with it a bit before class makes the classroom time more valuable. The most interesting thing to these students was mechanical splices. Most were unaware of the different types of mechanical splices. In addition to Masonry Design, a three-hour masonry laboratory component is included in Structural Engineering Laboratory that all undergraduate students with a structures concentration are required to take. The first hour is an introduction to masonry materials. The next two hours students spend mixing mortar and laying masonry. Recently, we have had students build brick walls, then test the walls in flexure at a later lab using a vacuum. 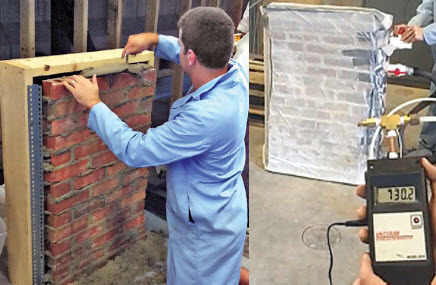 This project is based on an article in the TMS Journal, Testing Flexural Tension Strength of Masonry with Low- Pressure Vacuum, by Kenneth C Hover, Timothy K Bond, and David Farmer (Volume 31, Number 1, December 2013). In a later session, students present their results. While teaching masonry for more than 20 years has been an enjoyable experience for me, Masonry Design at UT remains a valuable course for students, and continues to be well received. The curriculum, students and I benefit from many industry people who have supported the course over the years through guest lectures, field trips and material donations. Over the years, we have toured brick plants, concrete masonry block plants and construction sites. Donated materials make demonstrations in joint reinforcement and veneer anchoring possible as well as providing materials for testing in the lab. And special thanks to the sponsors and presenters of that UPMW many years ago that set me on this path! Readers are encouraged to visit the web site for the class,http://ef.engr.utk.edu/ce576-2016-01. A special account has been set up for SMART|dynamics of masonry readers with the username masonry and the password smart. Feel free to do a few homework problems. The Masonry Society’s University Professor’s Masonry Workshop (UPMW) was developed to provide professors of architectural and engineering design and construction management current masonry material, means and method knowledge and numerous resources for use as professors incorporate masonry into their college curricula. The two-day event includes in-depth presentations and discussions about masonry-specific topics and innovative teaching strategies specific to the three different programs as well as interactive tours and demonstrations. Participants receive one-year membership in The Masonry Society, which includes subscriptions to TMS Journal and TMS Responds, copies of TMS 402/602 Building Code Requirements and Specification for Masonry Structures and other industry publications and workshop presentations. Training the educators in masonry ensures graduates of university programs enter the workforce and embark on their careers with an up-to-date skill set. It also strengthens the masonry industry-at-large with the coming together of academia and industry experts, sharing newest information and finding ways to efficiently and impactfully disseminate masonry education in very full university programs. First held in 1988, this annual program is facilitated by The Masonry Society, hosted by a different North American university each year and features a variety of expert speakers/presenters. University of California San Diego hosted The Masonry Society and UPMW attendees in 2016. For future workshops or more information, visit masonrysociety.org.